In the world of miniature gardens and fairy gardens, hobbyists have always known that their interest is accessible. Miniature gardens allow for a customizable experience. Therefore, whether you are a youngster or a wizened sage, a beginner gardener or a green thumb, one can dive into miniature gardening with positive expectations. Having unlimited design ideas is also good news for those on a budget! Although fairy gardens might look expensive, they do not need to eat up your bank account. If you follow just a few of our clever tips, you can be sure to improve not only your fairy garden but also your miniature gardening budget. Many gardeners like to visit local shops to purchase miniature accessories. Even if you have a favorite store in your area, it is smart to shop online. Many sites offer newsletters, sent to your email, that contain notifications about specials and sales. Have you been eying a new fairy house? A shop’s newsletter might have just the incentive you need to snap it up for an attractive price! 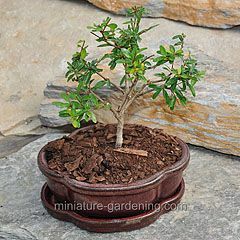 Miniature trees and miniature plants often go on sale towards the end of seasons. You will want to watch blogs, websites, and social media closely for end-of-season and clearance posts about sales, especially if you have grand ideas about next year’s seasonal garden. When it comes time to buy online, you can opt for free shipping and save money. Some sites offer free shipping if you purchase a minimum amount. You might also qualify for a Customer Loyalty Discount if you create an account on the store website. It is worth reading carefully and clicking around online to make sure you are getting the miniature gardening discounts and deals that are available to customers. 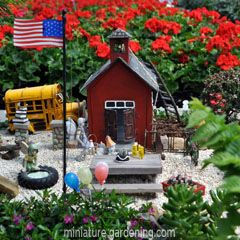 Additionally, do not be afraid to soak up all the available information about the miniature garden design. Blog posts, online galleries, and videos not only provide inspiration but also supply information that can help you feel confident and satisfied when it comes to your fairy garden. The more planning you do, the more likely you are to be pleased with your miniature garden in the end, and the less likely you will be to over-purchase or return items to the gardening shop. The retail community is home to a great variety of fairy garden accessories and other small-scaled figurines. You can fill your yard with miniature houses and garden fairies that will fall apart after a heavy rain…or you can seek out durable, high-quality accessories that will last. Consider your local climate and the types of weather your products will need to withstand, such as rain, snow, bright sunshine, or humidity. If you are trying to save money, investing now in fairy garden accessories from reputable shops will put less strain on your future wallet. Watch for items that are durable and sourced from well-vetted brands. If you are not sure about a product or brand, it never hurts to ask other gardeners about their experiences or head online to read reviews. Sure, many gardeners can attest that collecting store-bought miniature accessories is one of their favorite parts of the fairy garden pastime. However, that does not mean that your entire garden needs to come from the greenhouse or online store. When planning a miniature garden, you can substitute all sorts of things you have at home. For example for a fairy garden with faux miniature plants, instead of buying artificial snow, you could use cotton balls, white felt sheets, or even white fabric or pillowcases that you have around the house. Sprinkle a little glitter on top, and your miniature garden will transform into a winter wonderland right before your eyes! Seasonal gardens can also get an easy DIY facelift when you dress up your miniature garden fairies in new outfits of your creation (think Santa hats, mittens, spring dresses and more.) A do-it-yourself approach to some aspects of your fairy garden can help lighten the load on your budget. 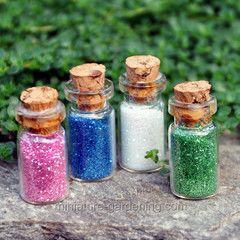 Crafting some miniature accessories and landscaping materials can also help you save up for an extra-special fairy house or another favorite miniature accessory. This blog post was published on 11/21/2018 13:24:03.